Kitchen and Residential Design: What happens when the lights go out in Spain? Check this out. The Tau Advanced Group rolled out the ultimate showstopper at Cevisama last February. Cevisama is the annual showcase for the Spanish tile, surfaces and bath industries. 79,000 people were in Valencia two months ago and all 79,000 of them stopped in their tracks when Tau asked and then answered the question, "What happens when the lights go out in Spain?' Watch this. This is an ordinary looking floor, right? Well, watch what happens after dark. The process Tau pioneered is called Afterdark and it's a resilient surface treatment that absorbs light in direct proportion to a light source's intensity. After it's exposed to intense light, it glows brightly. After exposure to less intense light, it glows less intensely. Afterdark isn't a gimmick but a genuine break through in the way cities can think about light. Afterdark is intended for use in public spaces and as sheathing for buildings. In a subway station, emergency lighting that requires no power to operate could be a life saver. Where I think it will prove its worth is when it's used on the exterior of a building. Imagine the energy savings if a building's exterior architecture or its signs required no electricity to light up a skyline. In a situation like a nightclub, Afterdark's responsive luminescence could make for interactive lighting installations. Check this out. Here's an example of Afterdark in mid glow. If you take a penlight, you can write on the tile with the beam and the tile will absorb the light energy from the penlight and glow back more brightly. Somebody wrote "Tau" with a penlight here and the name will glow like this for hours. I can see a wall covered in Tau's Afterdark in a restaurant or a club and every night it could feature a drawing. Or patrons armed with penlights could cover the wall with what ever moved them. What a great idea! Glow in the dark stuff has been around for ages, but I don't think anyone's ever thought of a real, practical application for it. At least not one like this. So what happens after the lights go out in Spain? Coolness happens, that's what. 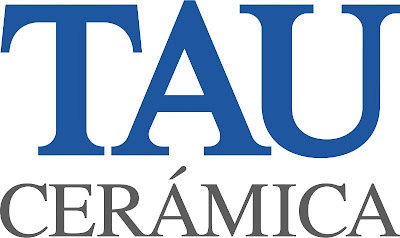 Check out the rest of Tau Cerámica's offerings on their website. That is cool. You could really do some fun stuff with that technology. You could use it on a tiled backsplash and then not need a night light. I've seen that Schluter has a stair nosing strip with a luminescent inlay available that glows for hours after the light is gone-great for safety in a public application or kinda funky in a home. I think it's really neat that companies are starting to make real use of glow in the dark technology. I'd love to see a building sheathed in the stuff. "UAU! That will match my neons under the car, my LedLCD on the dashboard, my sobrigthsilverthatreflectsmorethanmirrors rims, and I can match the bedroom with the neon yellow in my car back wing! Wonderful! I'll have 200 sqf of various glowing shades." Wow anon, we know different people.